You probably noticed Justin Thomas is on a hot streak. Already in this wraparound season, he’s won three times, including the last two weekends in Hawaii. He also shot 59 in that first round at the Sony Open at Waialae CC and then won on Sunday with the lowest 72-hole score in PGA TOUR history. In the world rankings, he’s now no. 8. Yep, that’s hot. For those lucky enough like me to attend the 2010 US Junior Amateur at Egypt Valley, Thomas is a familiar name and face. He lost in the 36-hole finals 4 & 2 to Jimmy Liu who broke a Tiger Woods’ record by becoming the USGA’s youngest national champion at age 14. The golf that day was superbly played. But Liu took command on the back nine of the morning session, ending up with an eight-under par round while Thomas hung tough with a five-under total. After 18 holes, Liu was 3-up. In the afternoon, Thomas cut the margin twice to a single hole. On the par-four fourth hole, beset by a pond and bunkers, he won by hole by driving the green. Yes, Thomas was long back then! But Liu prevailed by winning three consecutive holes on the second nine. Afterwards, I was impressed with Thomas’s candor and sportsmanship in defeat when speaking with the media. “It’s upsetting that I didn’t win, but it’s not upsetting that I didn’t lose it. I just got beat. 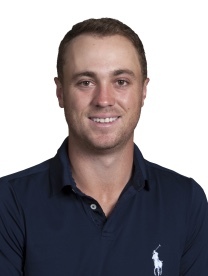 He (Liu) played great golf and deserves it.” Thomas came across as a mature, polite and extremely gifted player. Coincidentally, later that summer, I met up with Thomas and his parents as we sat in the shade behind the 18th green and inside the ropes at Whistling Straits for the PGA Championship. In fact, Thomas recognized me due to my hat—a red US Junior Amateur @ Egypt Valley model. We had a nice chat and I learned his father was currently serving on the board of directors for the PGA of America. At the time, I thought, “Justin has good and supportive parents.” Well, it went deeper than that. Justin’s father, Mike, was the head golf professional at Harmony Landing Country Club in Goshen, Kentucky and had served as the President of the Kentucky PGA Section. Justin grew up at the private course, first hitting shag balls at two years old, and was warmly welcomed and adopted by the membership. Mike was an accomplished player himself, having earned conference honors at Morehead State University. Justin Thomas’s early golf resume is impressive besides that runner-up finish at Egypt Valley. He was Kentucky’s Mr. Golf in his junior year of high school and led his team to two state titles. As a 16-year-old amateur, he played in the 2009 Wyndham Championship and shot 65 in his Tour debut and made the cut, becoming the third-youngest player to accomplish the feat. He excelled at the University of Alabama earning distinction in 2012 for winning both the Haskins and Nicklaus Awards, presented annually to the top college player. In 2013, Thomas helped lead Alabama to its first NCAA golf national championship and was named second-team All-American. After winning six college titles in two years, he left Alabama to turn pro. And what about Jimmy Liu, the phenom of the 2010 U.S Junior Amateur? He played a year-and-a half on Stanford’s elite men’s golf team in 2013-14 before leaving the program and the school. Although it was reported he had plans to resume his sophomore year of classes at Stanford, his name doesn’t appear on the team roster for the past two years. Currently in the Men’s World Amateur Golf rankings, Liu’s listed as no. 4081.